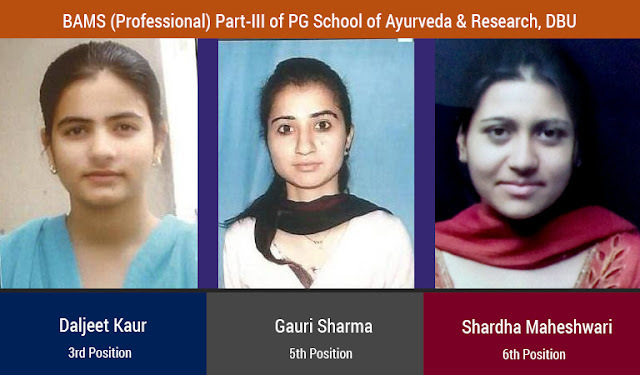 Student of BAMS 3rd (Professional) of Desh Bhagat Ayurvedic College has brought glory to the institution by winning top position in the Annual Examination conducted by Guru Ravidas Ayurved University, Hoshiarpur. College student Namrata bagged IInd position in the university by securing 1397/1850 marks. It is worth mentioning that Namrata has also demonstrated her talent by participating in various other social and academic programmes organised by the college from time to time. Desh Bhagat University Chancellor Dr. Zora Singh, Pro Chancellor Tejinder Kaur , Vice Chancellor Dr. S.S. Chahal and Pro Vice-Chancellor Dr. Shalini Gupta congratulated the student and whole staff on this achievement. They said that it is the result of the able guidance and hard work done by teachers as well as the student. Director Dr. Kulbhushan and Principal Dr. Smita Johal also congratulated the student and said that the institution is always on the way to provide better facilities to the students and believes in quality education. Namrata gave the whole credit for her success to the highly committed teachers, state-of-the-art infrastructure and congenial academic atmosphere in the college.